Fractionated CO2 is the gold standard in laser resurfacing. It uses energy to create microscopic cores of vaporized skin which then causes the surrounding collagen to repair and rebuild. 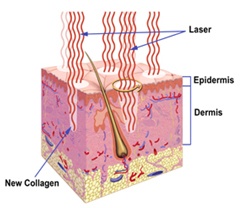 The SmartSkin™ laser uses small columns of energy to create a grid-like pattern of controlled damage. Tiny wounds are created by vaporizing the skin cells. These wounds stimulate the surrounding healthy skin cells to create new collagen and elastin. What are the benefits of fractionated resurfacing? Shortened healing/recovery times: Traditional CO2 treatments removed the entire skin surface, requiring lengthy healing times. Permanent skin lightening was also a problem (creating a “porcelain” look). The smaller fractionated technique of the SmartSkin™ only targets a “fraction” of the cells. The SmartSkin™ laser can be customized to your needs- depending on your goals and available “down time”. Dramatic results can be seen with just 1 session if higher energy is used. Or opt for mulitple, milder sessions with faster healing times. What is the cost of resurfacing? Since each treatment is customized, pricing varies. Typically, the price range will vary from $600-$3000. A topical anesthetic is applied for 30 minutes prior to the procedure. Small injections of lidocaine (anesthetic) are also done around the treatment area. There is still some discomfort, which increases when higher energy settings are used. Most patients describe a hot, tingling sensation. This discomfort can be minimized by taking prescribed pain medications prior to the procedure. This can be discussed further during your consultation. The discomfort is temporary and resolves once the procedure is finished. What is recovery like? What will I look like? Immediately after treatment: redness, swelling, warm sensation, pin-point bleeding/crusting or oozing. Second day on: itching, dryness, tightness, peeling skin. Specific instructions for skin care throughout your recovery will be provided for you. **With proper skin care and sun protection, results will last for years. The wrinkles and brown spots may never recur. Can the treatment be done with other cosmetic procedures? Most of the procedures we offer compliment each other well, however, your CO2 procedure will be done on a separate day. We will discuss these details during your consultation. Can I have my treatment on the same day as my consultation? Because preparation is often required for CO2 resurfacing, most treatments will be scheduled at a later time. The SmartSkin™ laser is located at our Virginia Beach office location. When performed appropriately and when pre/post instructions are followed carefully, complications are rare. Redness- a pink color may persist for a few weeks. In rare cases it may last for 3-6 months. This is more common in patients with a history of easy flushing or blushing or who have dilated or broken blood vessels on the treated area. Wound healing- typically takes 2-10 days for the outer layers of skin to visibly heal. The deeper collagen continues to heal and build for several months, but this doesn’t cause any “visible” abnormalities. Sun sensitivity – treated areas will be more sensitive to the sun for appoximately 4-6 weeks. Dr. Torosky recommends a life-long habit of sun protection which will maximize results. Pigment changes- the treated area can heal with either increased or decreased pigment. This is rare and most often occurs in darker skin 2-6 weeks after treatment. Pigment usually fades in 3-6 months but rarely can be permanent. Swelling- typically occurs immediately after treatment and can last for 3-7 days. Scarring- there is a very small chance of scarring. Thickened (hypertrophic) or keloid scars can form. Please tell us if you have a history of abnormal scarring. DO NOT PICK!! Eye exposure- laser energy can damage the eyes. You will have protective eyewear and asked to keep your eyes closed. Infection- Infections are rare when you follow the pre/post instructions. Dr. Torosky may prescribe an antibiotic to take during the healing process. Fever blisters/Cold sores- most people (over 70%) are infected with HSV (herpes simplex virus)- the cause of fever blisters . Many don’t know they carry this virus. Laser treatments can “reactivate” the virus in the skin. Dr. Torosky will prescribe an antiviral medicine that reduces the chance of this reactivation. An outbreak will increase the risk of scarring, pain and healing time. Should anyone not have the procedure? treatment is limited by skin color. This will be discussed during your consultation. There are alternative resurfacing procedures available (microneedling) for those patients that are not candidates for CO2 resurfacing. 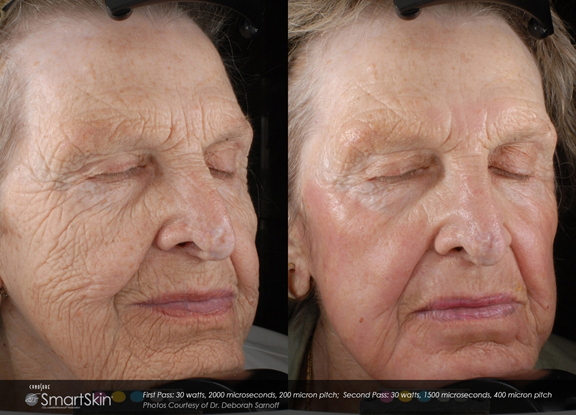 Interested in Fractional CO2 Laser Resurfacing SmartSkin™ CO2?